On the same descent where Fabio Casartelli died, Philippe Gilbert flies off the road. He suffers only minor injuries. 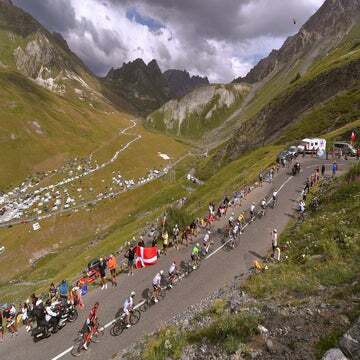 BAGNERES-DE-LUCHON, France (VN) — Quick-Step sport director Brian Holm had a front-row view to the aftermath of Philippe Gilbert’s horrific crash Tuesday at the Tour de France. It was what he didn’t hear that scared him more than what he saw. 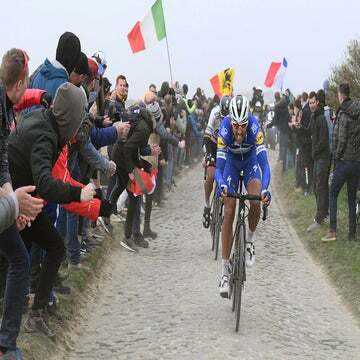 Holm was following the day’s main breakaway behind a group with eventual stage-winner Julian Alaphilippe when news crackled over the radio that Gilbert, alone off the front, had crashed over a stone barrier. The Danish director was soon waiting for Gilbert’s voice to call out for assistance, but there was only silence. Holm’s worry compounded when he arrived on the curve on the Col de Portet-d’Aspet to only see Gilbert’s bike on the road and no sight or sound of the Belgian star. Gilbert’s high-speed crash brought back tragic memories of Fabio Casartelli, who died in a horrible crash in 1995 on the same descent just a few kilometers below where Gilbert crashed. Gilbert impacted a stonewall barrier while Casartelli struck his head directly against a stone bollard. The Italian later died while being transported to the hospital in a helicopter. Holm hurried to the edge of the stone wall where Gilbert disappeared into a ravine and he was shaken by what he saw. With his jersey ripped and blood on his elbow and knee, Gilbert was able to crawl out of the ravine under his own power with the help of a fan who had scrambled down to attend him. After check-ups from Tour doctors, Gilbert remounted his bike and finished the stage in 142nd at 33:11 back. Gilbert, 36, will require stitches to gashes to his arm and leg. One of his socks was totally soaked in blood from the frightful crash. Examinations at the Toulouse hospital found that Gilbert had fractured his left patella, forcing him to abandon the Tour. But for Holm, a screaming Gilbert is still the happiest sound in the world.